Shop beautiful Historic Cottonwood in the Holiday Shopping Center, on Main Street and Front Street. The Artisan Exhibitor Square on Front Street will include artisan, antique and upcycle/recycle Exhibitors, food and music. 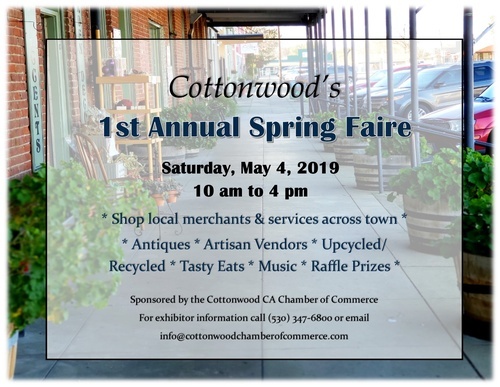 Shop around Cottonwood with a Spring Faire passport to enter to win a prize. While you're in town shopping, be sure to enjoy one of our dining establishments. To apply for an Exhibitor space... Download the application and return by email or mail.